People have spoken, results are in and Rex Dieter is already working on the patches. The KDE Games collection now has “Naval Battle” and “KSnakeDuel”, filling in for “KBattleship” and “KTron”. Results can be seen here and here. As you all know, KDE is a project that encourages as much cooperation with upstream as possible. So if a distro has a reasonable request we generally try to find a way to make life easier for them, as this will ultimately benefit all KDE users when they migrate between different environments. So it is time for us to make life easier for our Fedora friends, as they have been maintaining patches against some of our games for a while. Please help us choose a new name for KBattleship and also a new one for KTron. These will be considered for KDE 4.6, so we need you to act fast! The poll closes on Sunday, November 14th. Linux Educacional (LE) is a distro packaged by the SEED team at the Ministry of Education in Brazil. I posted about the previous versions already, you can find more info on the archives here and here. The LE team has been working on the 2011 version for a while. Previous releases used KDE 3.5, and the next one is going to be the first deployed over a KDE 4.x desktop. Helio Castro and I went to Brasilia a few months ago to field some questions, discuss a couple of design decisions that are important for the transition and to offer the help of the KDE community, if needed. We were very happy to learn that among all the options available the decision was made to stick with KDE as the LE desktop: one of the reasons was the possibility of deep and easy customization offered by the Plasma environment; as well as the need to preserve the existing investment in training for teachers and IT people and the familiarity of teachers and students with the existing KDE-Edu software. Then, during Akademy, we saw a lot of interest on this project coming from members of the Plasma, Edu and Oxygen teams. The plan was to foster collaboration between the KDE and the LE teams, and if possible to develop most of the customization features they needed upstream. A mailing list and a wiki page were created, and some ideas floated around. But… working upstream proved to be very difficult for this project. There were language barriers, and also issues related to timing and the decision-making chain. I find it understandable, but personally frustrating. Development is happening mostly at closed doors, as I was told the team is under a very tight schedule. Apparently a portion of the project is now being handled by the computer science department of UFPR, a federal university in the Paraná state in Brazil. Their staff is known for its technical excellence and skill, so I have high hopes for the quality of the final implementation. Some of the people involved have been spotted on the #kde-brasil IRC channel, and the KDE community at large is still available to help of course, if required. So, even if we could not really collaborate in the true open source fashion for now, it is nice to know that the work we are doing is useful and relevant to the educational community, and that a KDE4-based LE will equip thousands of computer labs next year. And I can see as well that this is a slow learning process, and maybe one day we will have the opportunity of really working together on a global scale on a deployment like this. 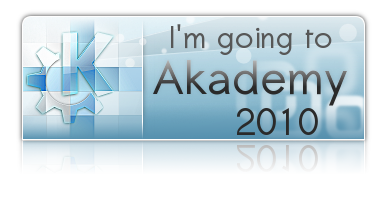 Thanks to all members of the KDE community who spent some time during Akademy and in the following weeks thinking about the educational desktop and how to contribute to efforts like the LE customization. I am sure we will have the opportunity to build on several of these ideas when the right time comes. For now, the “we build it and they use it” paradigm remains the most common, and it is not a bad one per se. But I still hope upstream development and collaboration slowly becomes the norm and not the exception. Well, the last few months have been very busy. And I realized I have not blogged since Akademy. Of course, this is the perfect excuse to change blog hosts again 🙂 Livejournal has been good, but ultimately the amount of spam on comments is just too much, even for a semi-alive blog like mine. So WordPress, here we go, with a new and shining blog.br address. As a bonus I collected all the posts (minus comments) from my previous blogspot and livejournal addresses, and archived them here, for posterity. Let’s get back to Akademy 2010, then. What can I say? Perfect location, perfect organization, and perfect company. It was great to meet old friends again (David! Neja! Jure! lots of people…) as well as make new ones (hi Nuno!.) Too bad I could only stay for 4 days. At the last morning I conducted a BoF about the involvement of KDE with the Linux Educacional project going on in Brazil, an effort that we attempted to jumpstart and that generated a lot of interest inside the KDE Plasma and Edu communities. I will update you guys on how the project is going in my next blog entry. Unfortunately only for the first 4 days, but hope to meet as many friends as possible again. See you in Tampere! Akademy-br is over, and for me it was a great event. I expect the results to roll in over the next couple of months, as several projects have been started. Tomaz and the people working on card games for KDE Games will probably chime in soon, and I know the promo people are preparing the video and photo collections from the event. I spend some time on the event helping the people that is going to work on the new KEduca. The summary of this project can be read on this message to the KDE Edu mailing list, so I will not repeat it here. Welcome Syst guys, and I hope this collaboration with KDE Edu brings lots of rewards for both our community and your users as well. Among several interesting conversations and quick hacking sessions, on the last day I had a chance to work very briefly with Luiz Romário, a very brilliand and young member of the KDE community here. He is working on several projects, and I am happy to see his patches finding their way into ReviewBoard and soon into Kiriki. In CampKDE 2009 (Jamaica) I had already experienced this feeling of a conference/sprint that happens in the same location as the lodging and where food is served. This saves a lot of hours as people do not have to scramble for food or transportation, and the result is that the rooms were busy even in the middle of the night. Not something possible for a big event like Akademy, but something to look for when we scout for locations for the smaller meetings and sprints, imo. b) even “more differences” can be attained when people work together towards a common goal, and this is what these guys are doing with the LiveBlue user group.